It suddenly comes again. You feel numb up to your chest and your speech is slurring. You can barely see anything because your vision is getting blurry. It feels like you have oven mitts on your hands and you’re looking through clouded glasses. You’re experiencing what Michelle Wilda regularly goes through, the symptoms of a devastating disease. Michelle Wilda, from Saskatchewan, has Multiple Sclerosis. It’s frustrating, depressing and painful to live with. Sadly, the disease commonly occurs all over the world. Multiple Sclerosis Awareness Month is this May, and patients from Canada suffering from MS are sharing their stories about living with MS. 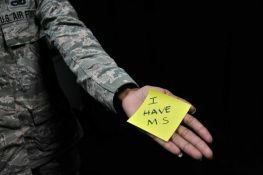 Multiple Sclerosis is a neurological disease that affects the central nervous system. Currently Canada has the highest rate of MS in the world. In the province of BC, about 12,000 people have the disease, and many of them go through multiple challenges every day. Often, people with MS have difficulties with employment, and at the same time receive disability assistance payments less than $910/month. Lina Vallee, a 35-year-old woman from Powell River with multiple sclerosis, considers herself fortunate. Her mother supports her by cooking and cleaning, and she considers herself lucky because she never went hungry. However, Ms. Vallee became unable to work in 2009, roughly four years after she developed symptoms in 2005. She lamented the loss of feeling fulfilled by working. Multiple sclerosis also affected Ms. Vallee in other ways. She remarked that she never feels “100%” and rarely leaves the house. According to Ms. Vallee, she “can’t walk very well,” and requires either crutch-canes or a wheelchair to move around. Lina also stated that she has trouble with memory and thinking. Lina still finds joy in her life despite living with MS. She spends her days on the computer and volunteers at Poverty Law Advocate Program once a week. She isn’t alone all the time—she has a lovely dog that keeps her busy at home. The disease also can be genetic, as Heather Armstrong and her mother found out the hard way. Currently, her mother is diagnosed with cognitive MS with dementia and lives in a fully assisted care home. Her mother, according to Ms. Armstrong, “couldn’t speak,” and lost the use of her legs and the ability to walk since she collapsed when trying to get out of bed about 3 or 4 months ago. Armstrong’s mother is now in a wheelchair and is losing the ability to recognize her daughter.